Kitchen organization solutions for pantry, cabinets, refrigerators, drawers and more to maximize space and function! Kitchen organization is essential to a functional kitchen that is easy to work in. When we designed our new kitchen, we did so with kitchen organization in mind to maximize space. 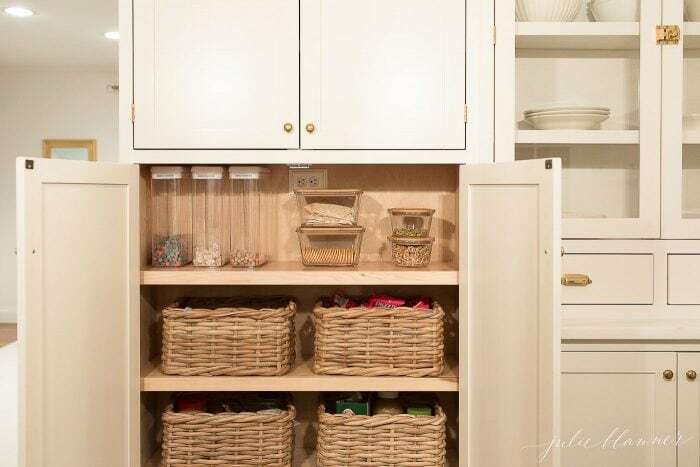 In this post you’ll find kitchen storage ideas for cabinets, drawers and more along with tips on how to organize kitchen cabinets. 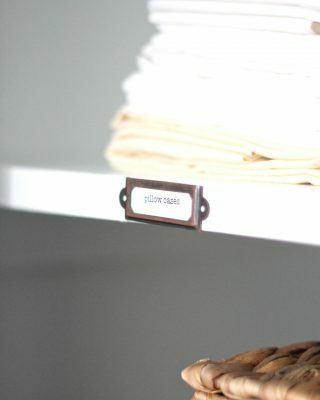 Staying organized is easy when you implement thoughtful solutions that take into consideration how you use the space. Kitchen organization doesn’t have to happen overnight, in fact, it’s something you may need to tweak from time to time as your needs change. That’s okay! To start, I recommend going for a quick fix! So, we’re going to start with simple projects first! You can tackle one or tackle them all! 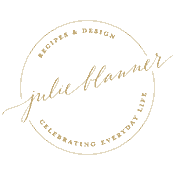 Click here to join me in getting organized, one space at a time with achievable ideas, printables and more! 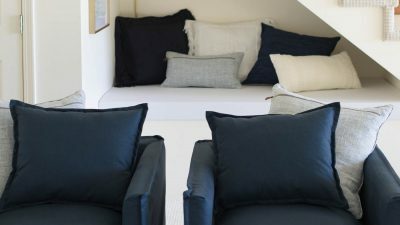 One thing you’ll notice is that when you’re organized, you suddenly find yourself with more space! We went from having cabinets that were overflowing to empty shelves! Declutter. This is the first step to organizing your kitchen (or any space). Eliminate any excess, damaged or infrequently used items. Keep things accessible. For example I store my step stool just beneath the kitchen sink since it’s primarily used to reach the cabinets just to the left of it. Small kitchen appliances are stored at eye level making them easy to reach. Keep items as close as possible to the space you utilize them. For example frequently used cooking utensils in a crock next to your range, pots and pans next your your range. Selecting similar items will allow them to stack easily. Group like items together for example, all bakeware in the same cabinet. 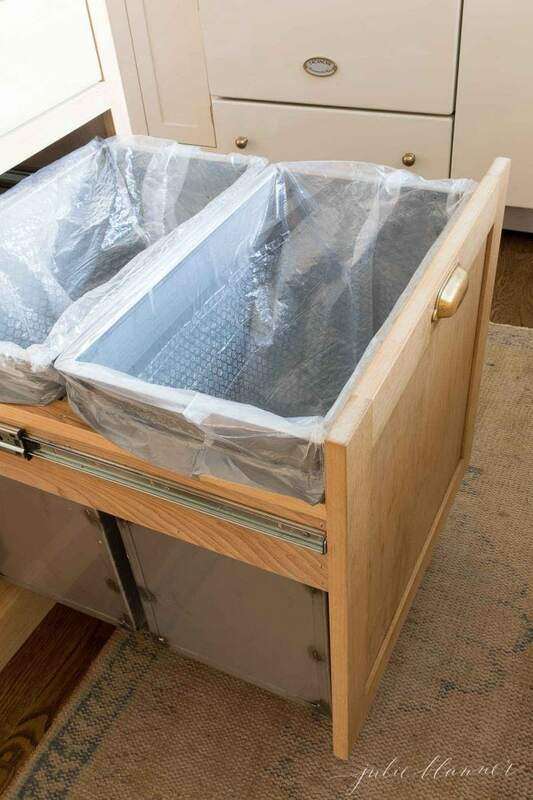 Utilize storage containers that are easy to clean and for food, easy to see through (glass). 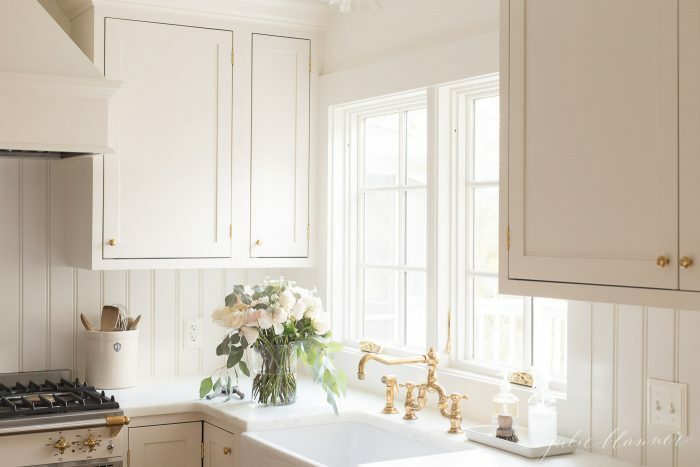 Organizing your kitchen countertops will provide you instant gratification and hopefully, inspire you to move onto the next area in your kitchen organization project. Get tips to Eliminate Countertop Clutter here. One of the best kitchen organization tips I can share is do what works for you. Kitchen Sink Organization is simple. Pair down to the bare essentials of what you frequently use and choose them wisely. A few well selected items will serve you well. While it seems ideal to store dish soap and a scrubber below the sink, it doesn’t work for our family. We wash at least a few dishes by hand daily. 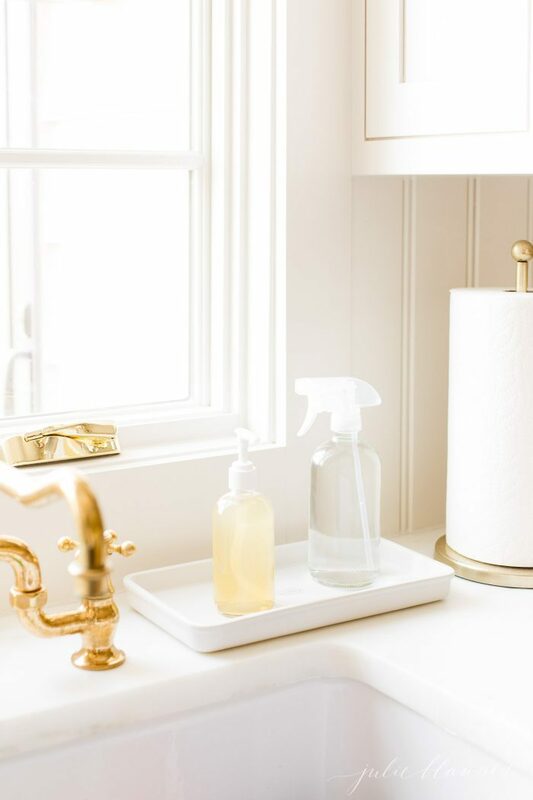 We have a tray with dish soap (that doubles as hand soap), a scrubber and our countertop spray readily available next to the faucet at all times. Because they’re in beautiful glass dispensers, they don’t feel offensive or out of place. Which brings me to one of my favorite kitchen organization tips! 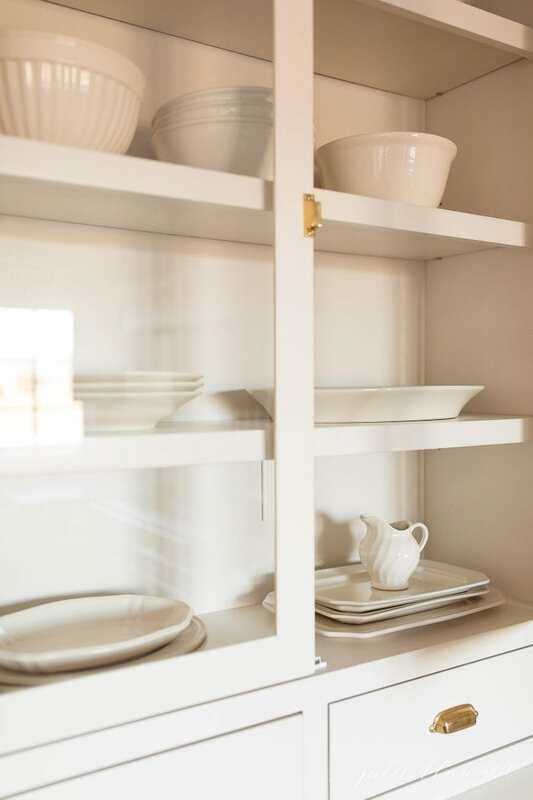 Think utilitarian and select pieces that fit into your decor that add function to your kitchen. You can shop our kitchen on Amazon. What lies beneath doesn’t have to look like a horror movie! The cabinet under the kitchen sink has always been awkward. 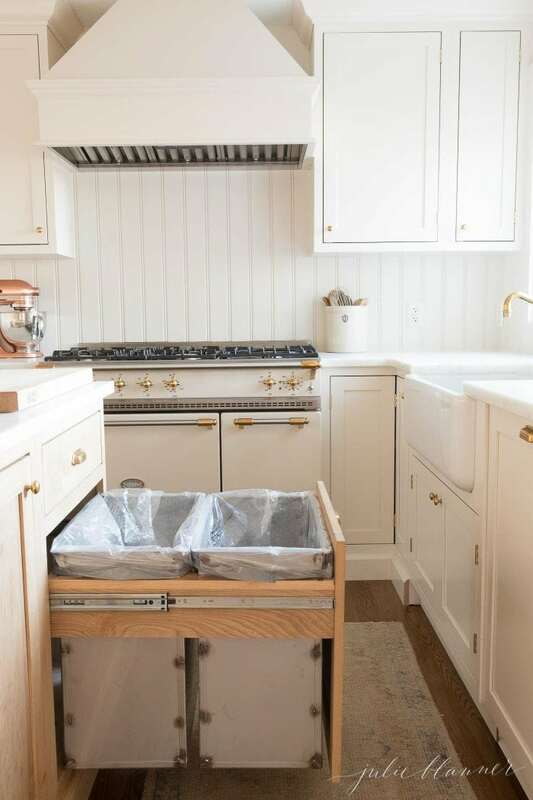 Though it’s often dark and filled with pipes and a garbage disposal there are kitchen storage ideas that will help you make the most of the space. 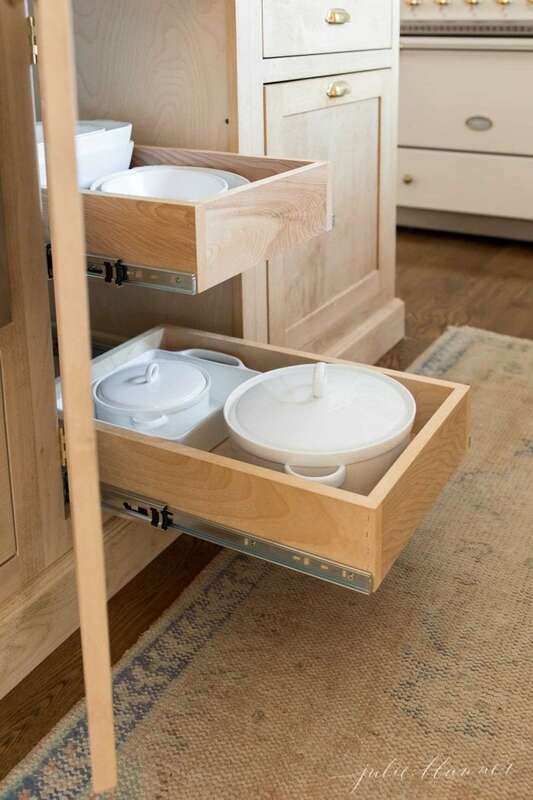 Whether you add baskets and crocks or opt for a pullout drawer this is a space to keep only the essentials like dish accessories and cleaners. 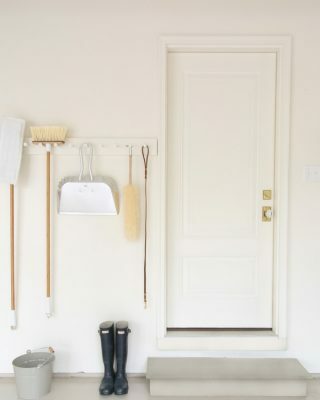 You can also use 3M hooks on the doors or towel racks to add the illusion of even more space! Keep them together using a basket or caddy so that they don’t fall over or leak. 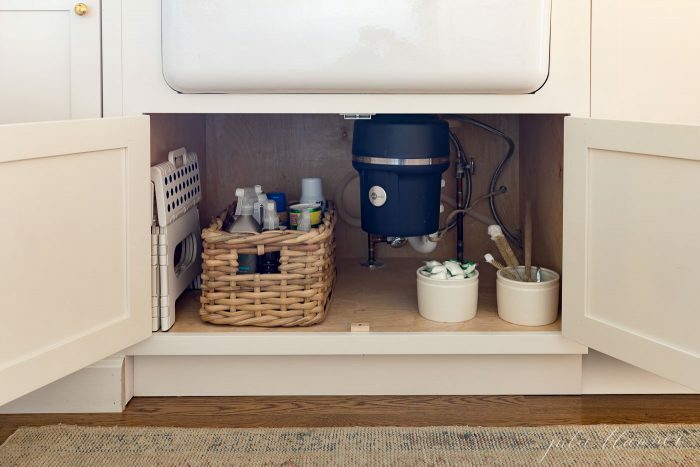 You can find more Under Sink Storage Ideas and tips to organize under your kitchen sink here. 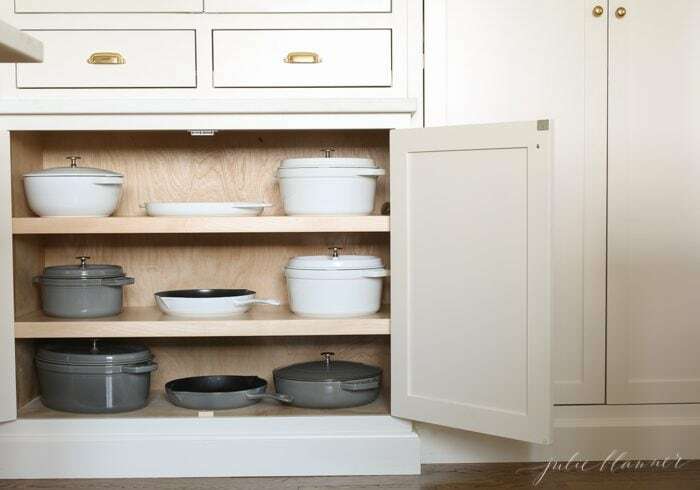 Pullouts offer a great solution to maximize small cabinets and accommodate pots and pans. You lose a little space when using pullouts, but gain a lot of function. A quick pull and the pots and pans are easily accessible. Having a few well selected pots and pans makes them stackable as well. We had another cabinet made to the max width required to host my collection of cast iron pots, pans and dutch ovens. 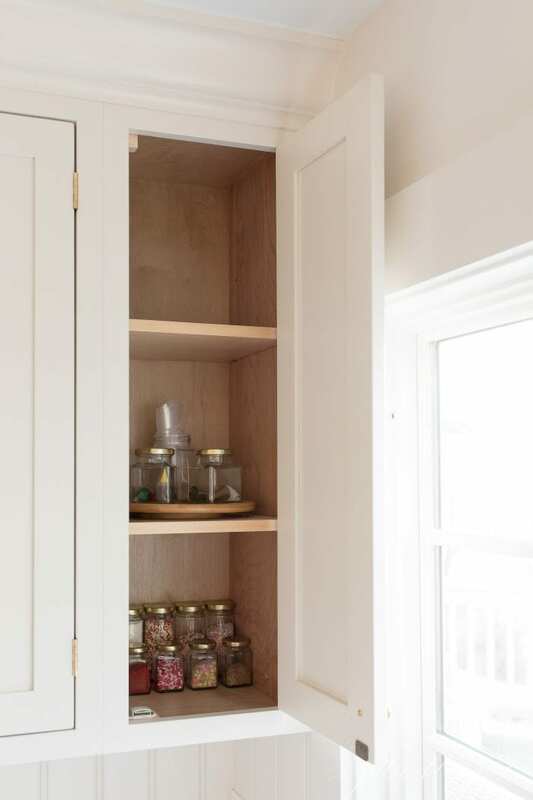 A Kitchen Pantry should be designed for easy access. In fact, we have ours at eye level for the girls. Everything is within easy reach which helps them make their own breakfast and pack lunches without turning it upside down. 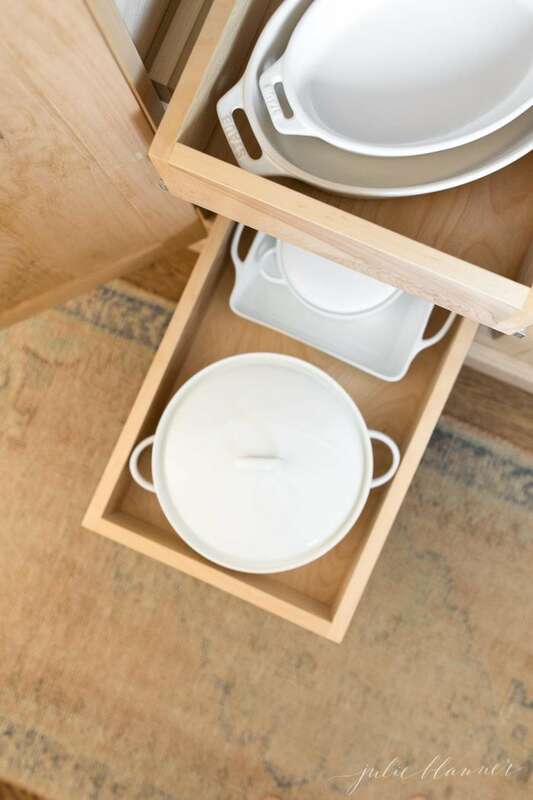 Sturdy, washable baskets and storage containers keep it accessible, organized and easy on the eyes. 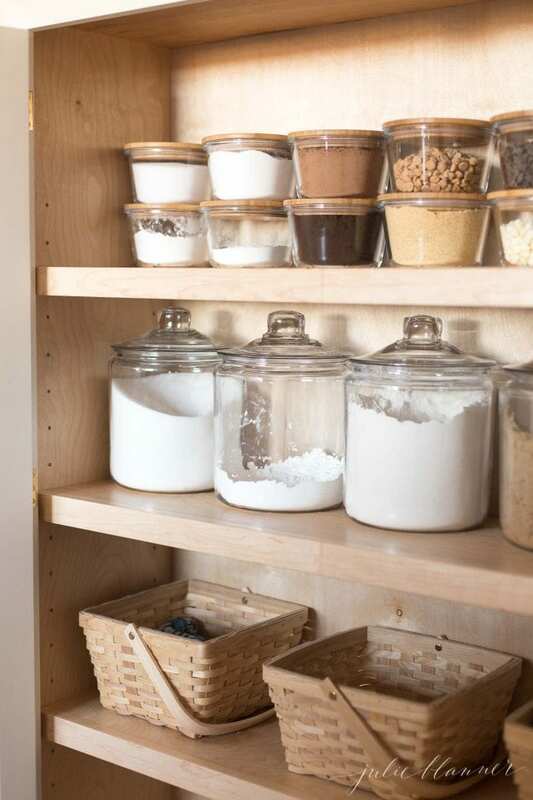 You can learn How to Organize Your Pantry Cabinet here. Yes, we have a baking cabinet! I do a lot of baking so I wanted to create a center just for that. 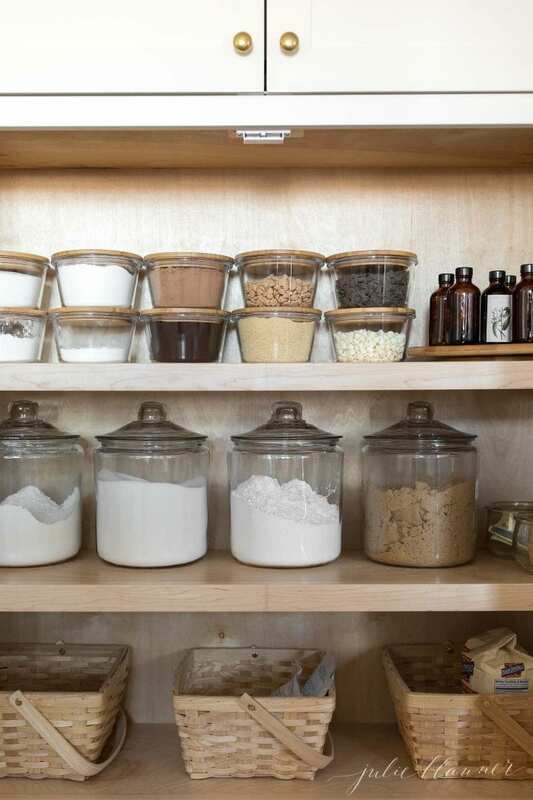 In our baking cabinet you’ll find easy to access jars filled with flour, sugar, brown sugar and confectioner’s sugar. They’re at waist height making them easy to pull out. If you have plenty of countertop space you can stow them there as well. 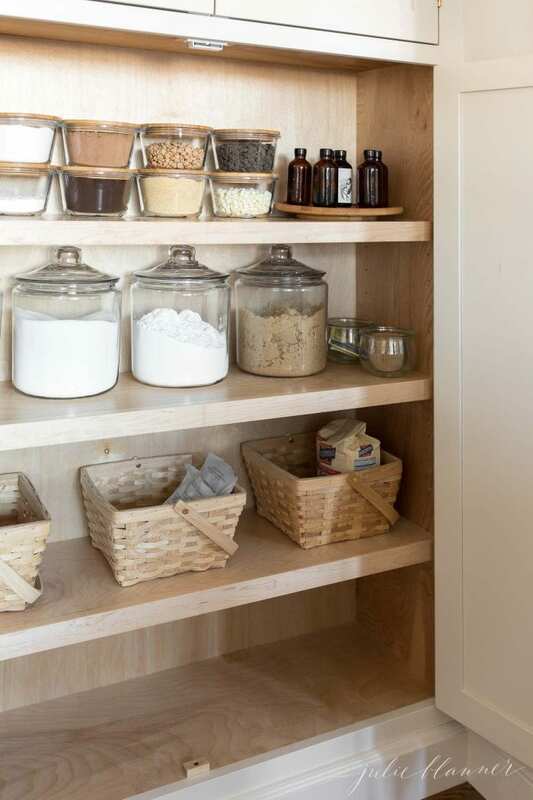 Glass jars with wood lids keep baking essentials including salt, baking powder, baking soda, cream of tarter and more accessible. 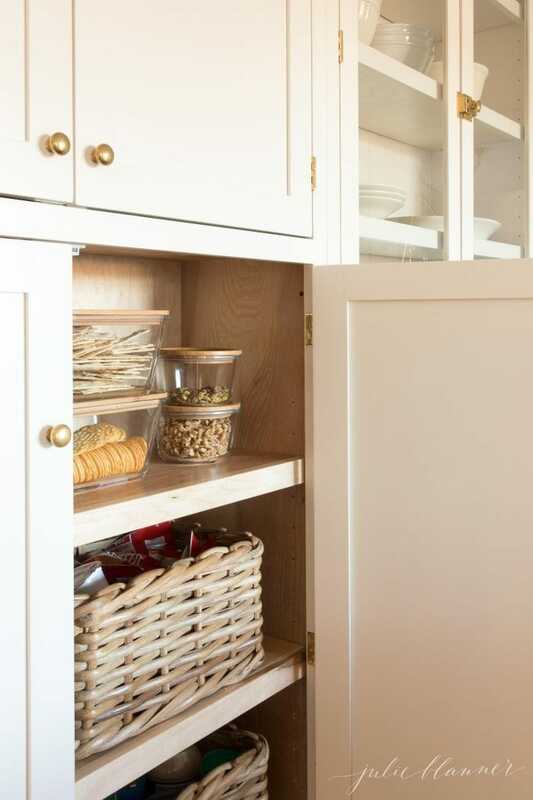 Incorporating a lazy susan can often add space and function in addition to keeping items from falling over. They’re great for extracts. It would be ideal to keep sprinkles in the baking cabinet, but with three girls, I can’t keep them out of them! So I made the most of an awkward space and created a sprinkle cabinet! They’re used less frequently than most things in our kitchen and still near the space all of our baking takes place. They previously were in an array of containers. Keeping it uniform makes it easy to see what you have available, stack (if needed) and store. Tackling a spice cabinet can feel really overwhelming. 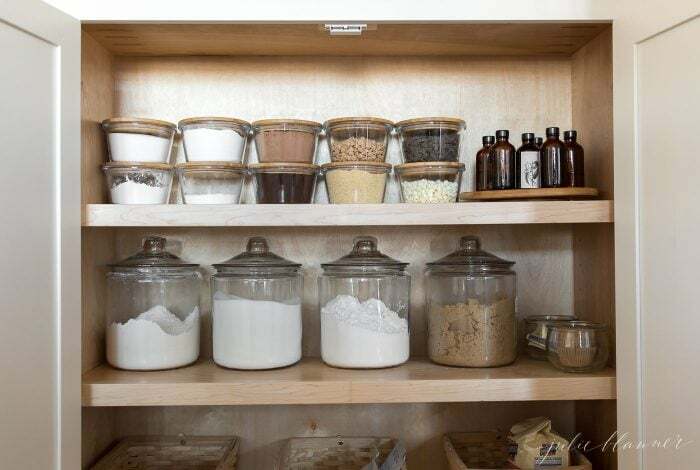 But the same kitchen organization tips I shared earlier in this post apply – remove, eliminate excess and expired and replace in cohesive containers. 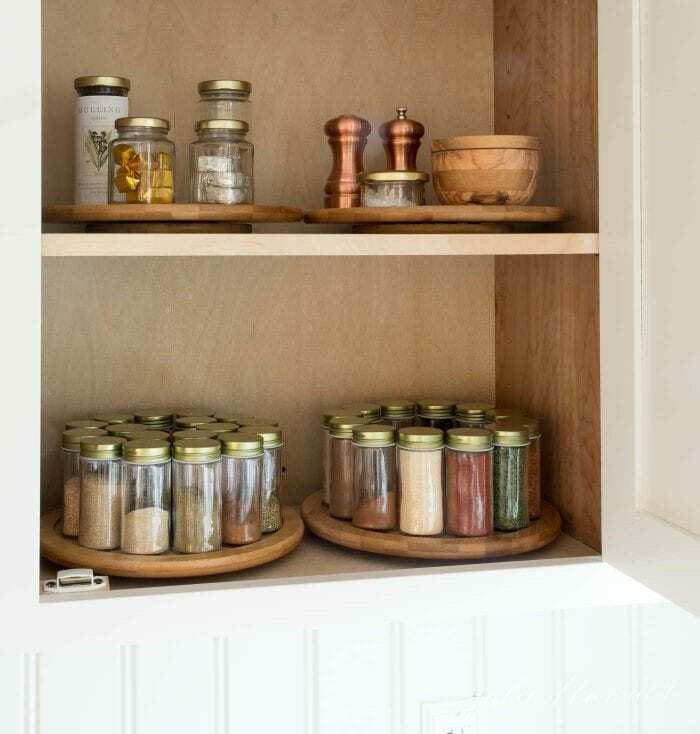 Again, a lazy susan is a great choice for most spice cabinets so you can easily see and grab what you need. The more, the merrier! 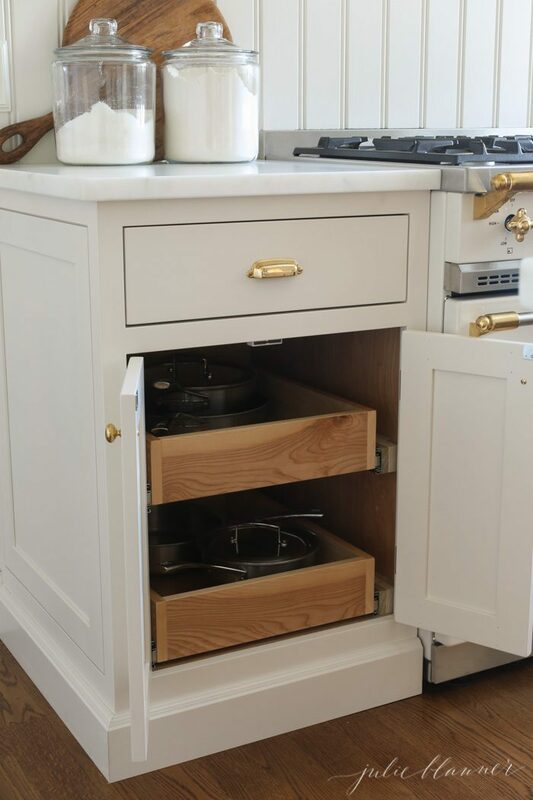 A large lazy susan consumes more cabinet space. If you only fill the outside, you have a lot of wasted space inside the lazy susan. If you fill the interior, it can be difficult to see and access spices there. Adding several smaller can allow you to see all of your spices without wasting space. Should you need to have any spices inside the circle, choose those that you don’t use often. 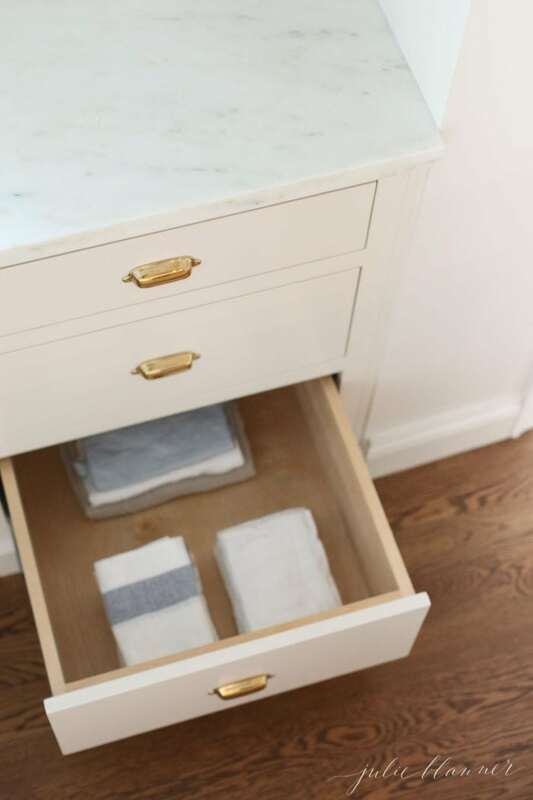 If you have the space (and more importantly the need), it’s nice to have a dedicated drawer for your kitchen towels. 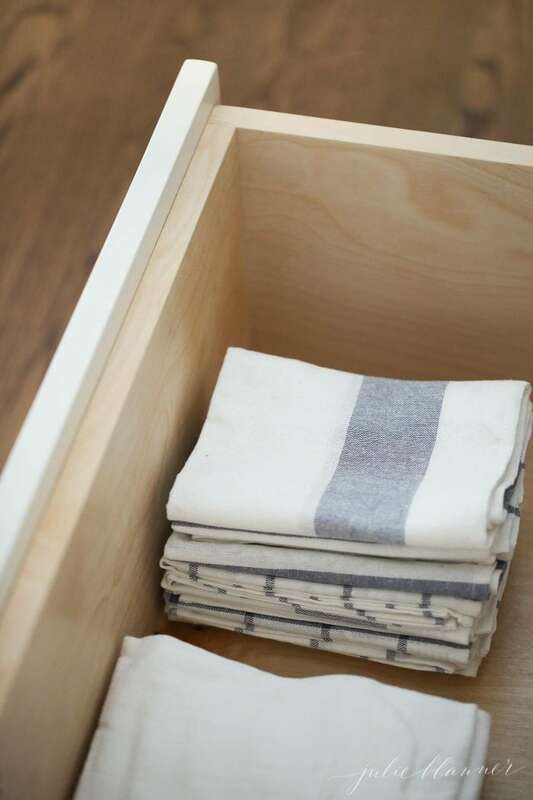 To keep it tidy and organized I recommend using the same kitchen towels or up to 3 styles so they fold and stow nicely. 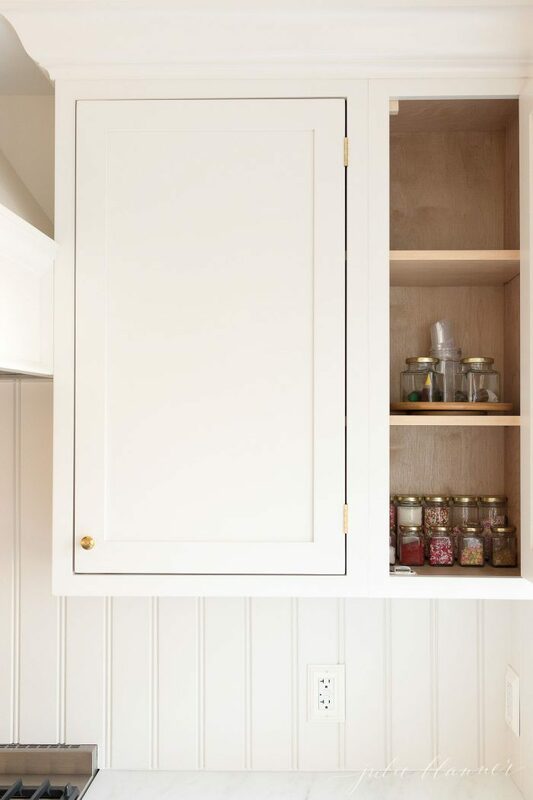 This is also a great space to keep an apron if you have one and don’t have a space to hang it. One of my biggest regrets in our new kitchen is listening to our carpenter and not getting some of the built in features I wanted. He steered me away from a built in utensil drawer because it’s difficult to clean. A pullout drawer solution isn’t much easier. In fact, we have opted to drill ours in so it doesn’t slide. 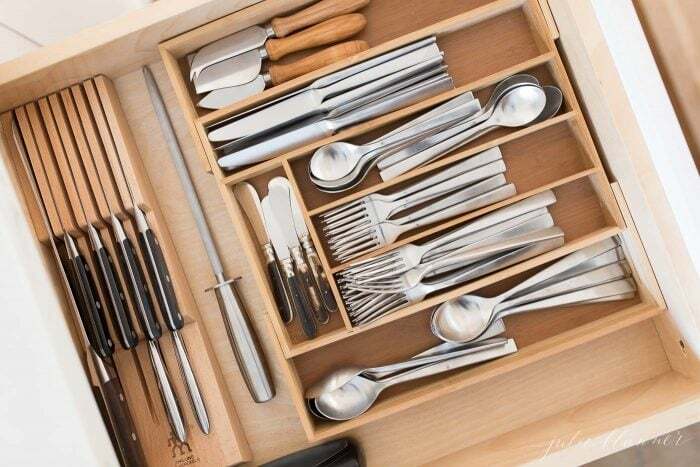 To organize your utensil drawer, have an insert made to fit (available on Etsy) or use an expandable flatware drawer. I also love adjustable drawer dividers. 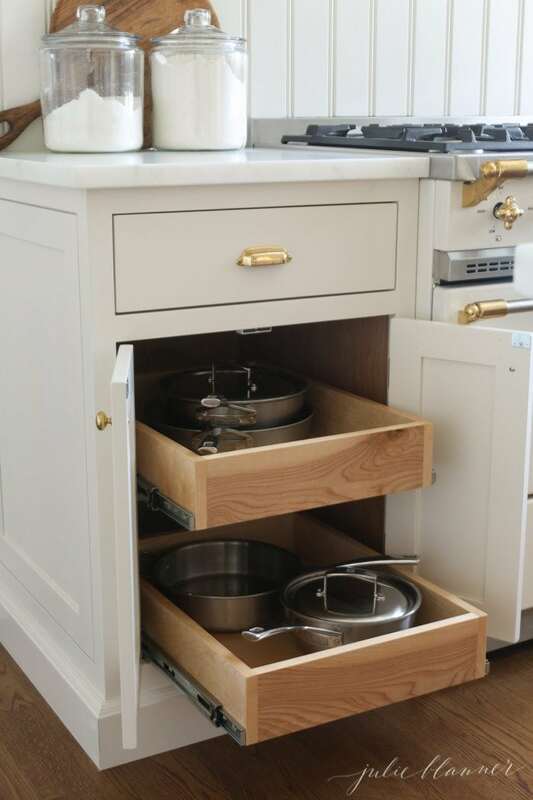 These are especially great for cooking utensils stored in a drawer. I love a narrow cabinet that allows baking sheets to stand upright, but we were out of space. I have found that a drawer works quite well for storing baking sheets and pans. 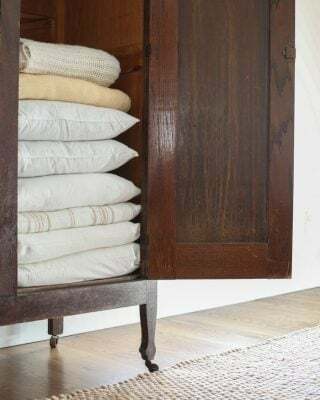 They stack easily and you can store a lot of them in a small space! 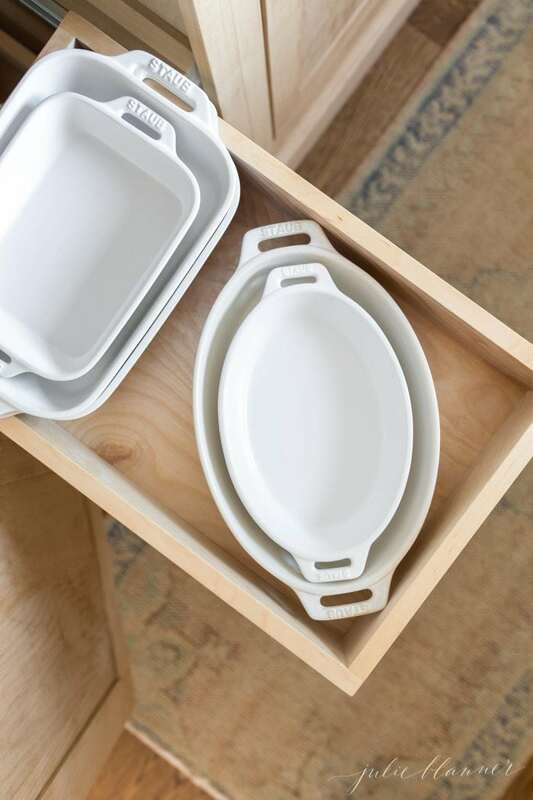 Baking dishes, much like pots and pans, work well with pullout drawers. Again, choosing dishes that are similar in style will allow them to stack easily. 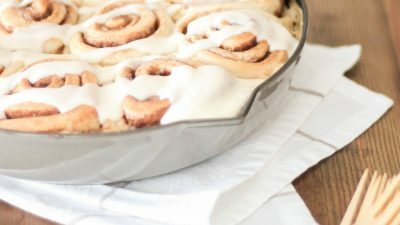 Less frequently used baking dishes (and anything in your kitchen that is infrequently used) can be stored on higher shelves. 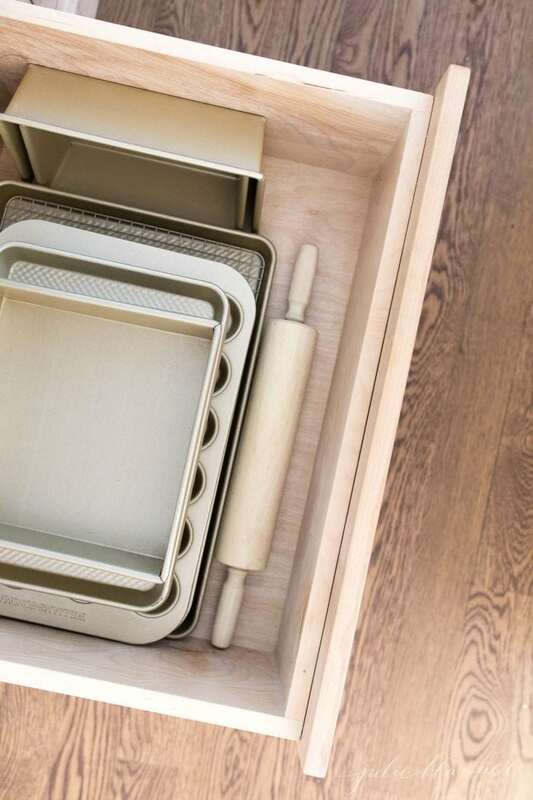 Our specialty and seasonal bakeware is stored in an upper cabinet. If you use a small appliance more than 3-5 times a week, you may want to keep it on the countertop. Less frequently used appliances like a waffle iron or food processor are best stored from waist to eye level. That keeps them easily accessible, but stowed away while not in use. If you don’t use them often, place them in the top of your cabinets and if you need space, another room such as the basement. I tend to use platters weekly, so I have a cabinet dedicated to them. When not in use, they make a beautiful display. 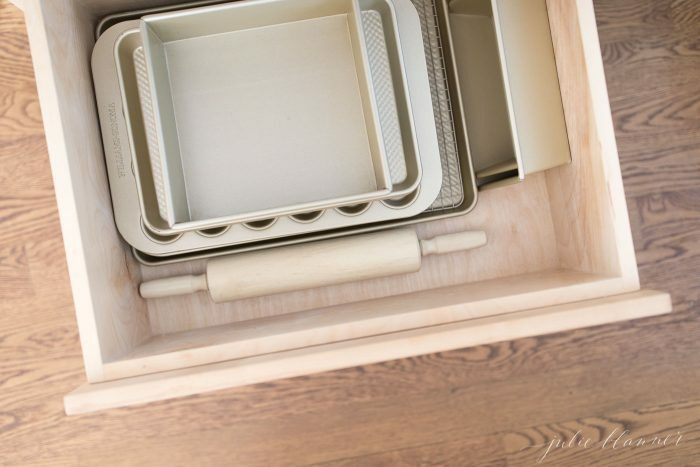 When in use, the hutch doubles as “pie storage” holding baked goods until they’re ready to be served. Stack like items when possible to make the most of the space and group together to make it visually appealing. Organizing your refrigerator can be one of the quickest, easiest and most gratifying kitchen organization projects. It’s simple, remove, eliminate excess and expireds, wipe down, adjust shelves and replace – in storage containers, if needed. I like to remove excess packaging because it makes it easier to see what you have and what you need. We have ours designed for the girls to pack their lunches without assistance. 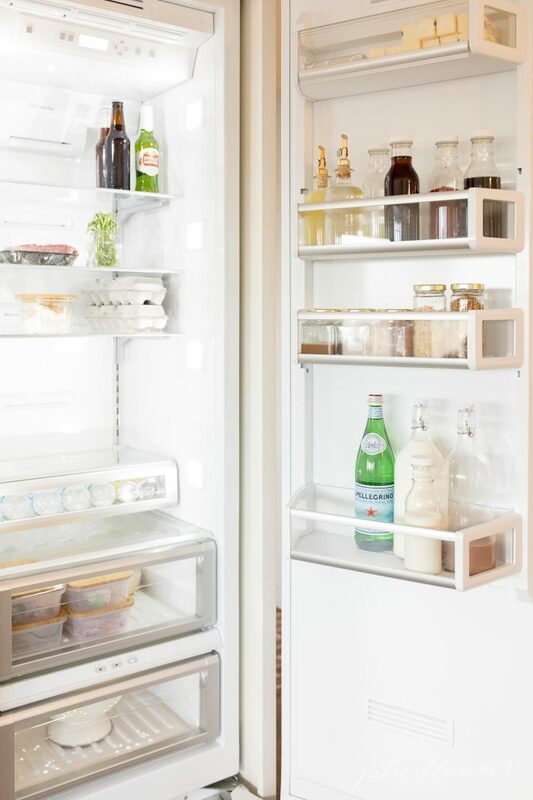 Consider your needs when organizing your refrigerator. 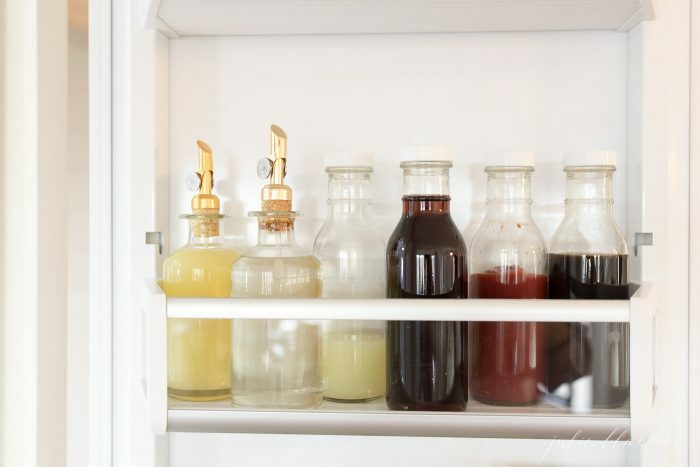 Get more Refrigerator Organization ideas here! If you cook often, then you know how important it is to have a well designed kitchen trash and recycling bin. Ours were initially standard size kitchen trash cans, but Chris had a welder custom make bins that fit the max height and width of the cabinet to maximize space. It’s one of my favorite features in our kitchen are our oversized trash and recycling bins. When we come in with the mail, we immediately go through and toss and junk mail into the recycling bin. The trash can is just below the cutting board so that anything that needs to be discarded can be done without effort or mess. It’s okay to adapt as your needs change. Right now we’re baking less so my flour and sugar jars are stowed away. They were previously stored on the countertop where our mixer currently resides. Whatever you do, make your kitchen work for you! You can see more of our kitchen organization in the youtube video embedded in this post. Don’t forget to click subscribe! As always, you can shop our home below, on my site in the shop and on Amazon. Do you have any kitchen organization ideas and tips I missed? I’d love to hear! Also, don’t forget to show me your cabinets in Celebrating Simple – the Facebook group for sharing secrets and celebrating wins. Where did you find the storage baskets,containers with wooden tops, and the spice jars? The glass jars with wood lids are available on Amazon (follow my link), but appear to be discontinued in stores. Enjoy! I looked at your you tube on kitchen organization a d see that the glass jars were from I,ea, but they did not show the wooden tops, which I really like. 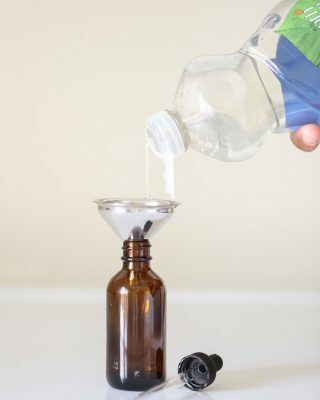 Does I,ea have wooden tops for each size jar; and if so, how do you order those? Thank you. I loved your kitchen organization. Thank you, Nancy! The round glass jars with wood lids are intermittently available on Amazon (follow my link), but appear to be discontinued in stores. You can find square there currently. Thank you so much for sharing your organization ideas for the home. 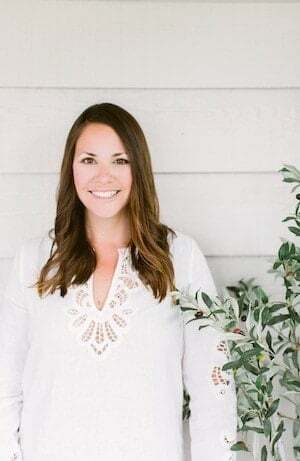 You are such an inspiration! I just love the jars with the wooden lids. Where did you purchase those as well as the wooden lazy susan’s. I’m glad you enjoyed them! The round glass jars with wood lids are intermittently available on Amazon (follow my link), but appear to be discontinued in stores. You can find square there currently. You can also shop some of the products by scrolling through at the bottom of the post. 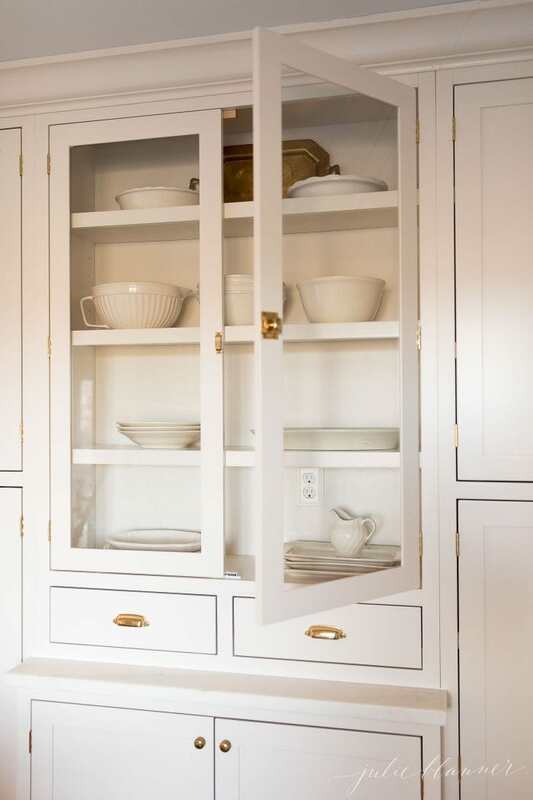 I am interested in why you decided on inset cabinetry rather than overlay? I just love the clean look, totally personal preference. I love your kitchen and how organised and big it is! I have much smaller space to work with in our rented central London apartment, but it could definitely do with some decluttering and organisation too. Two areas I really need to focus on are under the sink and fridge. The pale green containers? They carry them in the Target dollar aisle on occasion for $3/each. Enjoy!